Book Club 4: The Doors of Perception. Welcome to the fourth instalment of books to read in Avrilbandaids very own bookclub!! 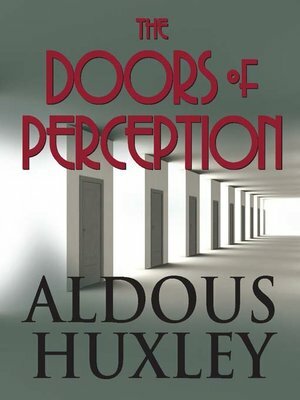 I have chosen as our next book "The Doors of Perception" by Aldous Huxley following the success of his other work read in bookclub "A Brave new World". I've managed to find a PDF version you can download for free and by updating your ereader to read PDFs you can read it too. The book itself is only 20 pages long as far as I can make out but they are large pages. Here is the link: psychedelicfrontier.com/free-book-doors-perception-aldous-huxley/ Good luck Downloading everyone and I look forward to discussing the book further with you all in this thread! Your link was broken btw, so I fixed it. Also, it's worth noting that you can either view the book as a web page or a PDF. I have a hard copy on my shelf somewhere. I'd love to join in but sadly I don't have the time. Downloaded. Can't wait to read this one. Can't help but draw on personal experiences of drug use and hallucinations to compare to Huxley's trials with mescaline. The worst hallucinations I ever had were when I ate about £15 worth of cannabis in one go when I was about 15. It crept up on me and before I knew it I was very much off my face and not really in control. It does go to prove that all you need is some cannabis to get totally off your rocker as much as Aldous Huxley is, just eat it. After that LSD was the most powerful hallucinogen i have tried and after that magic mushrooms. Ecstasy and speed and cocaine and heroin are a different experience. I have tried mescaline once but I didn't think it very powerful. Some legal highs have also made me hallucinate in the past too. I like Aldous Huxley's very disciplined approach to describing his experiences, let's be honest, the author does have a tendency to talk out of his arse at the best of times but he really does excell in this book at trying to describe the sensory experience of taking drugs. Not far into it at the moment but just wanted to state my own personal experiences with mind altering drugs. Not enjoying this book very much. Thought it would be better than it is. I don't know if I'm reading the edited version or what but it seems a bit short and the author is blatantly talking out of his arse on purpose. Finished The Doors of Perception. Quite enjoyed it. The last 4 or 5 pages are dedicated to discussing the positives and not so much negatives of taking mescaline. I'm not quite sure what the thrust of his argument is for promoting mescaline. Something to do with people being able to broaden their awareness of reality, being able to broaden their sphere or sensory perception but he discusses this in a round about way; hinting at the possible benefits of the drug. Having read the book I must admit I would quite like to try mescaline myself sometime but without trying to write a book about it. I think Huxley loses his way on occasion when trying to formulate his arguments but I've read worse books. Welcome back Avengium by the way. I will wait for the next book. Welcome back Avengium. We urgently need another book to read for book club. Anyone can pick it, I really don't care who. 50% of the way through the book and I'm enjoying it so far. I've never taken drugs in my life though so I don't have much to compare it to, but the book doesn't simply state what it feels like, but how it is and could be applied to art, religion etc ... it's pretty interesting stuff. I'll post more thoughts when I finish it later tonight. I've finished reading Doors of Perception, quick question though: did you read it's sequel Heaven and Hell too? I did because it was part of the same book but didn't realise until after I was finished that they were technically two separate books I won't talk much about it here though because to be quite frank I didn't much enjoy it in comparison to Doors of Perception. As mentioned before, I have never taken mind-altering drugs and don't really know much about them either other than portrayals of them in the media and some very brief, scantily described instances in fiction of which they were not the focal point. It was therefore quite interesting to read about Huxley's experience, particularly with a drug such as mescaline. The thing that struck me most about mescaline is that to a large extent his mental faculties remained intact. He mentions how he had no trouble remembering what he said and done under the influence of the drug, he wasn't acting particularly outlandish and was able to maneuver himself quite well, so much so that he took a walk to the ''World's Biggest Drug Store'' with total ease and control. According to Huxley, what it does do is dramatically heighten your sensory perceptions. The best example of this in the novel, I think, is when he talks about becoming entranced by the pattern in his grey trousers, describing it as though it were a world unto itself. It seems as though it makes the user a lot more perceptive to up close details, but the effects lessen when taking in a larger area or viewing from a distance. It was all very interesting and the drug was painted in a very favourable light overall, apart from mentioning about it being taken under ''unfavourable'' conditions such as a person who has high anxiety or depression, and almost seemed like a promotion for taking the drug haha. I liked how he described the side-effects as a way of escaping the structures we have built up in our mind e.g. language and symbols, which seem wholly inadequate at describing such an experience as the taking of mescaline. It was also interesting to read his ideas about how people who have certain mental health disorders seem to be living in a perpetual state of the negative side-effects of this drug. Overall, I really enjoyed it. It certainly made me think deeper about perception and increased my understand of some mind-altering drugs. Good choice ben545. As the book #5 to read. I didn't enjoy this book so much. It was a bit short and I think maybe I'm not academically minded enough to fully appreciate it like you ezzz. For me taking mind altering drugs is a form of recreation in much the same way i enjoy alcohol except the experience is perhaps not such a social event. Charles Bukowski sums up the drug experience well in his book "The Post Office" when he says he doesn't do drugs but he knows who to contact if he feels like 'hiding from himself for a few days'. It's a good way to spend your time if you've nothing better to do and you don't really feel up to facing the world not including ecstacy and cocaine which are social drugs i guess. Fear and Loathing in Las Vegas is a good drug book as is Satan Wants Me by John Irvine. I've done ecstacy maybe 3 times and decided i didn't like it. Even though you think you're having a great night out the following morning you realise you were just on drugs and the come down can be quite savage. Cocaine is a curious drug to take socially because it increases your confidence and people tend to gravitate towards you when you're using it. It is a party drug but my main concern with both ecstacy and cocaine is you can't be sure that what you're taking isn't either spiked with something or cut with something dangerous. You can't really go wrong with smoking cannabis, my drug of choice if i had to choose one. I think i found my next book choice for BA. Epic fantasy in ancient age. After @ezzz book and ben545 of course .